Although a country dweller at heart I am fascinated by the reflections that can be seen in the windows of modern city steel and glass buildings. My inspiration for this theme is a photo I took whilst in Las Vegas last year. I took several and wanted to use one showing a reflection of Circus Circus. In the end though I opted for this refection of a building under construction in the windows of the now closed Riviera building. I liked the way the structure was distorted by the windows. 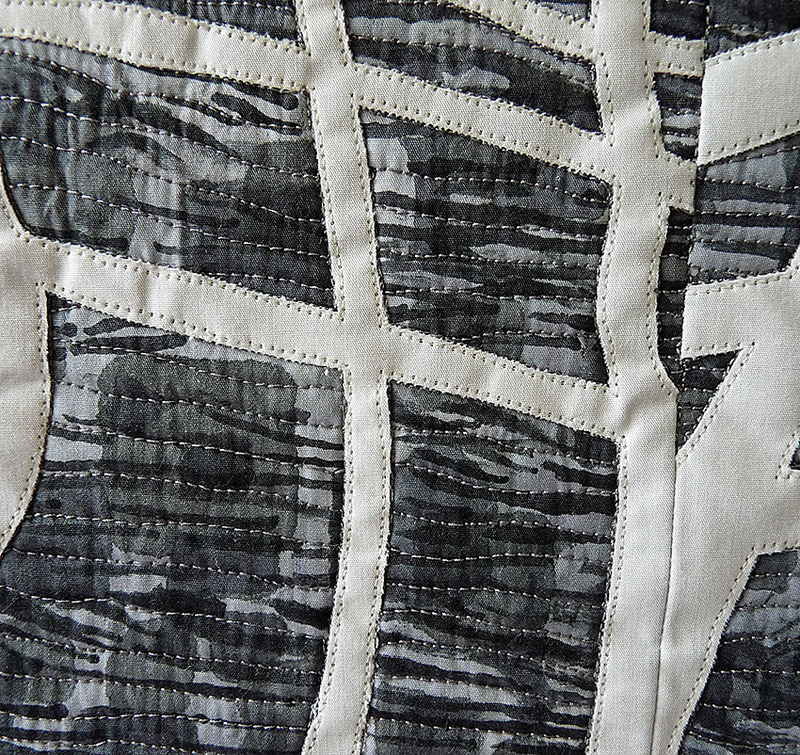 The quilt was made by making up the individual windows and then stitching them together. The grey background (shadow) in the building is fabric painted by overlaying 2 different commercial stencils onto a pale grey wash. The sky is a hand dye. I carefully cut out each window from the stenciled background fabric and appliqued the white concrete structure. Using a template I cut out the top of the building from the top windows and fused them to the sky and then stitched the windows together. The lamp post, seen in some of the windows, was stenciled using a hand made freezer paper stencil and a shiva oil pastel. 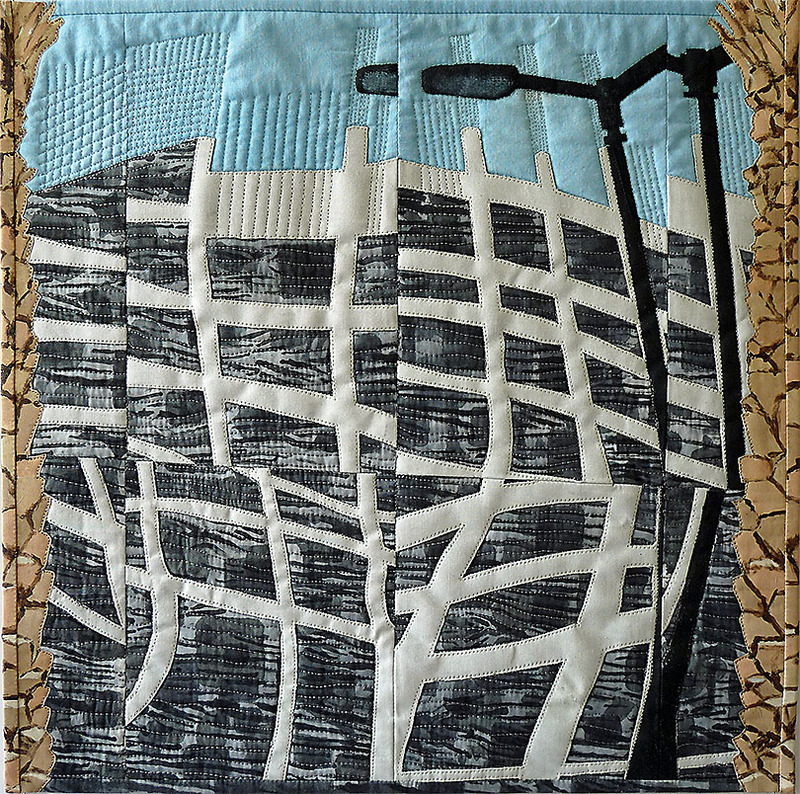 Free-motion quilting was used to outline the building structure, add some texture to the shadows and, using 100 silk, add an impression of the steel structure seen in the photo at the top of the unfinished building. I had thought to use organza to give an impression of glass but sampling made it look like the building was behind and not in the glass so I opted not to use it. Finally I used the sky and background fabrics for the top and bottom bindings. For the sides I opted to follow the photo and frame the piece with two palm trees. These were not too clear on the photo so I used a photo of a palm here in Muscat and painted them onto fabric using acrylic paint and fabric medium. I then fused the cut out edge of the two palms to either side and then used a strips cut from the side for the bindings. Overall I am please with the way it has worked out. A very original approach, beautifully worked. Indeed a wonderful interpretation of reflections; I admire your technique to create the shadows/reflections in the glass and how well you have captured the distortion. Wow! A very different way to treat the theme, but so effective ! and your piece is very well worked ! bravo. How intricate a process! You certainly succeeded in showing the distortion a reflection carries with it. I love the hand paints to create the reflection. The reflections in the windows of sky scrapers can be more interesting than the buildings. You have done a great job. Thank you for explaining hwo you achieved some of the effects. Glass and reflection, a great theme, endless and always surprising. You made a great impression and I love your work. Especially the hand painted fabric in the grey tones catches my eyes. I am always in awe of the reflections in this tall glass buildings. The way how you have interpreted them in textile is beautiful. I really like the palmtree edges. I admire your skill in making this piece. I too find reflections like this fascinating. I too am fascinated by reflections. I love the way you stenciled the gray background. So nice how the lamp post repeats in your work. Very effective binding! You have certainly captured the distorted reflections. I love the detail in the palm trees and they make a great textured frame for the building. A very eye catching piece.